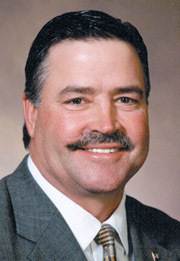 The President of the Iowa Farm Bureau Federation is heading to Washington today to meet with U.S. Agriculture Secretary Tom Vilsack. Craig Lang says with so many farmers struggling to make ends meet, he wants to talk to the former Iowa governor about how to bring back profitability to the ag industry. He says it’s been especially tough for livestock farmers. "Especially the pork and dairy industry and you’d have to throw the cattle industry in now too, because the amount of loss per animal going on and it continues to happen and the price hasn’t adjusted in the way we think the price should adjust to bring some profitability back to those livestock sectors," Lang said. He plans to press Vilsack about finding more places for producers to sell their beef, pork and milk. "The need to move ahead on bilateral trade agreements because we think those are so important. Colombia, Peru, let’s strengthen South Korea, let’s get the China market open back up," Lang said. Lang also plans to discuss what he calls the "heavy regulatory burden" handed farmers by the federal government. Adding to the concerns of Iowa farmers this year, Lang says, is the severe hail storm that ruined crops in large portions of the state.